It’s not really ice cream “season” yet in my part of the country. It’s more like very cold slush season here still. However, I have an ice cream recipe for you today. As far as I’m concerned, there is no real season for ice cream. Cold weather or hot. . makes no difference to me. I do know some people who only eat it during the warmer months of the year. This was the Valentine’s Day dessert I made Tim. It’s certainly a splurge but very worth it. I could not believe how wonderful it was. Why don’t I make ice cream more often? Oh right, because you’d have to lift me out of my house with a crane if I did. Truth be told, I own two ice cream makers and I hadn’t used either in five years or more. They sit on a shelf in my basement taking up space and collecting cobwebs and spiders. The thing is, homemade ice cream seems like sooooooooooooo much work. I can run to the grocery store and be home with a half gallon in 20 minutes! So much more convenient. Instant gratification. Isn’t that the way to go? Store bought ice cream is easy, convenient, tasty and comes in a zillion flavors and styles, but sometimes homemade is just what you need. 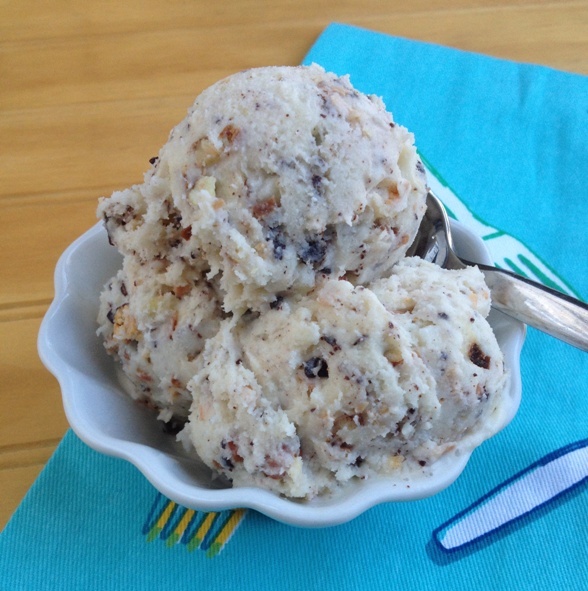 You can control the ingredients, the quality and you’ll feel so proud of yourself for using that ice cream maker! Wash out the spider webs first! Of course, don’t think I am going to be making ice cream all the time. It’s still a time-consuming project for me. I don’t have forethought for that most days. I’m as lazy as the next person. Of course, Tim did have a few flavor ideas that he may have suggested I could make for him so if ever I’m feeling ambitious you might get another ice cream recipe from me. Toast the coconut and the almonds. Chop the chocolate. Set them aside. You will need them the next day while churning the ice cream. You will need an ice cream maker. Follow the manufacturer’s instructions. Mine has a canister that needs to be frozen the night before you want to use it. I put the canister in to freeze the same day I make the ice cream base. It needs to freeze overnight and the ice cream base needs to cool in the fridge overnight. It needs to be fully cold before I can put it in the ice cream maker. Place egg yolks in a large bowl and set aside. In a sauce pan bring the sugar, salt, cream & milk to a scald over medium heat. Stir to dissolve the sugar. Do not let the mixture boil. Remove from heat. Whisk a few spoonful of the hot milk mixture into the egg yolks to temper them. Whisk the egg yolk mixture back into the cream mixture and return to a medium low heat. Stirring constantly, cook until thickened. Remove from heat. Stir in the cream of coconut. Put ice cream base into the fridge to chill overnight. The next day, pour the cold ice cream mixture into the prepared ice cream maker. Churn according to the instructions for your ice cream maker. 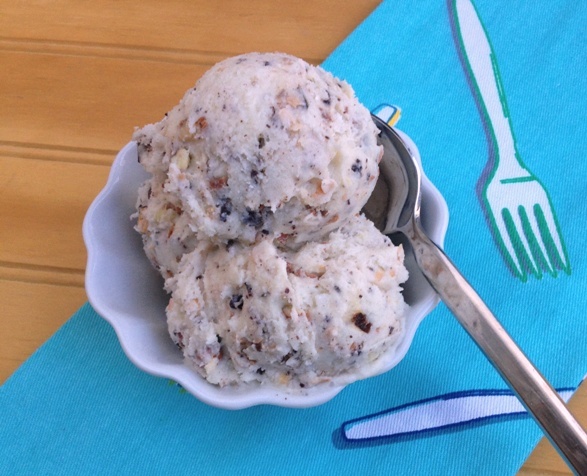 Once the ice cream is the texture of soft serve, add the coconut, almonds & chocolate. 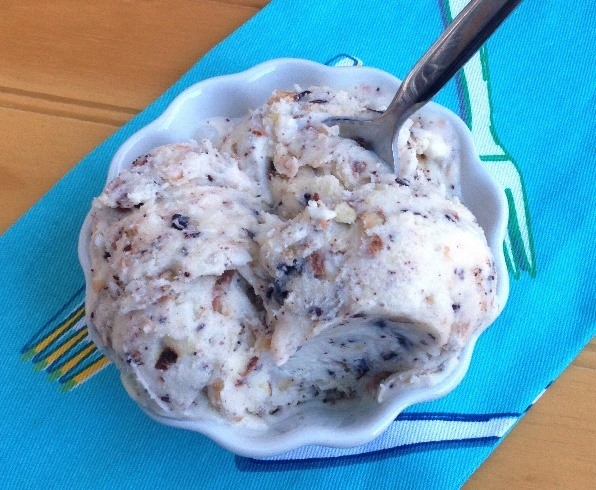 Scoop into an airtight container and place in the freezer. Freeze several hours or overnight until firm. At that point you can scoop the ice cream and serve it.